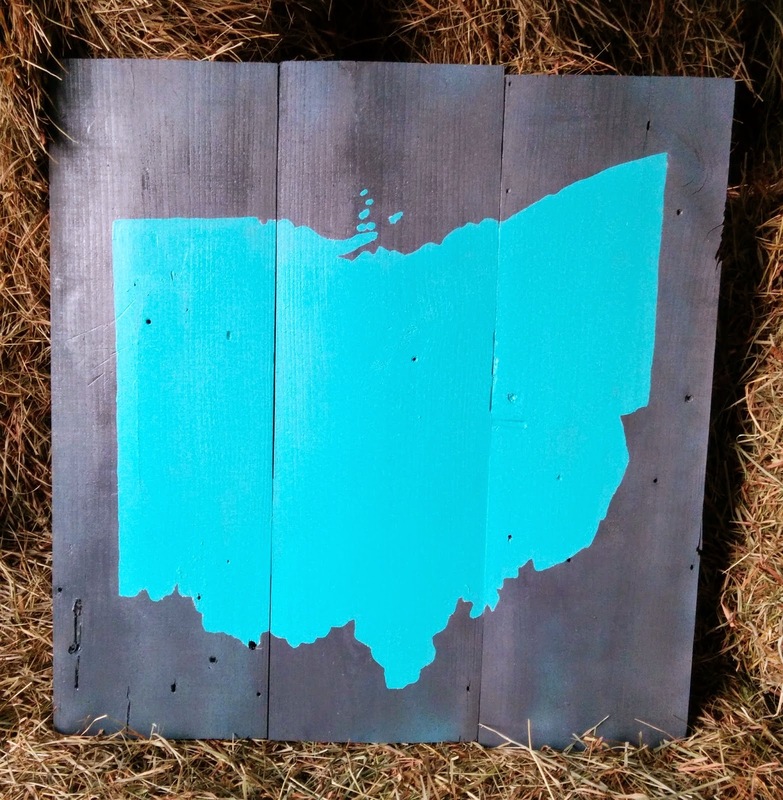 I fell in love with MilwaukeeUp's recycled pallet art as soon as my mom pinned it on Pinterest. You can see the Wisconsin silhouette here. I didn't have an old pallet, but my dad has a stash of planks from an outbuilding he demoed on their property in western New York. 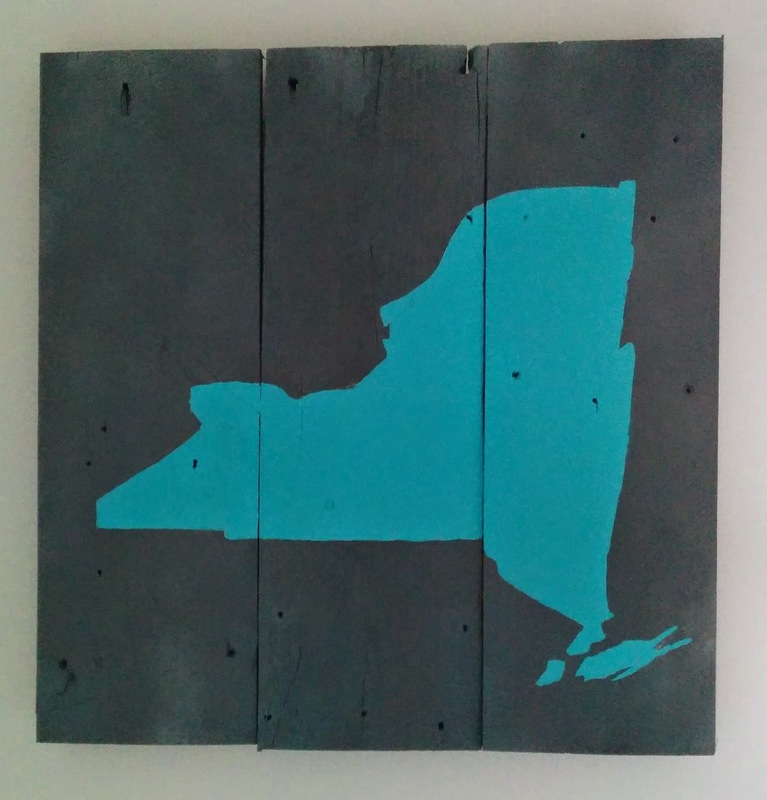 I made an Ohio outline for me, and I knew mom would be a little jealous so I made a New York silhouette for her. She LOVED it and immediately hung it in her bedroom (see last pic below). 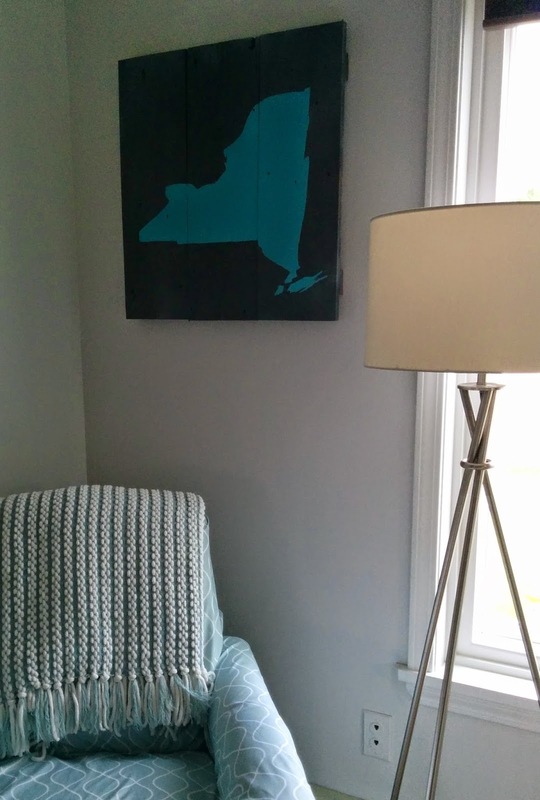 This is a pretty basic project if you have beginner level carpentry and painting skills and equipment. I set up the wood on sawhorses in dad's barn, set the kids to work pulling nails, dad finished pulling the bulk of the nails while I talked about alpaca fleece with mom, and then used a circular saw to rip right through them. The pieces aren't perfectly equal, but I think that's part of the charm. 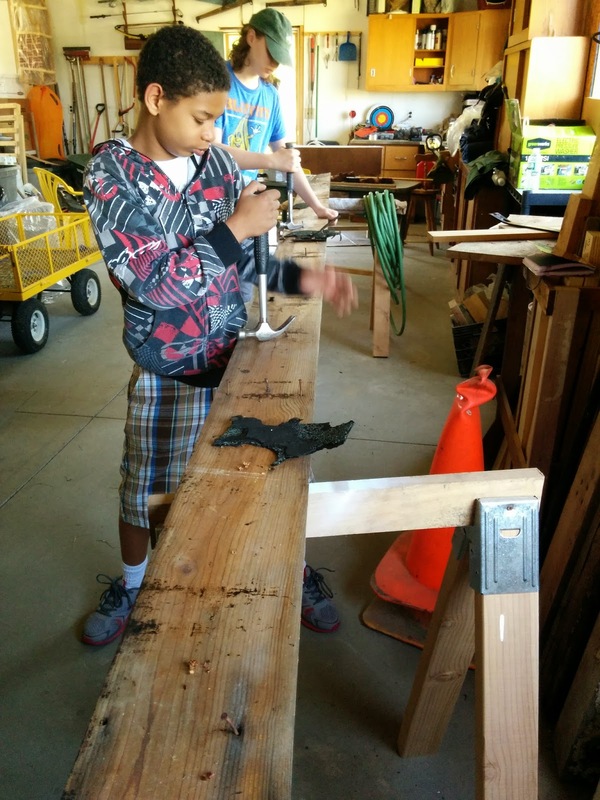 You could use planks of varying widths as MilwaukeeUp did in the original piece. Lay out your three planks side by side face down as shown below. 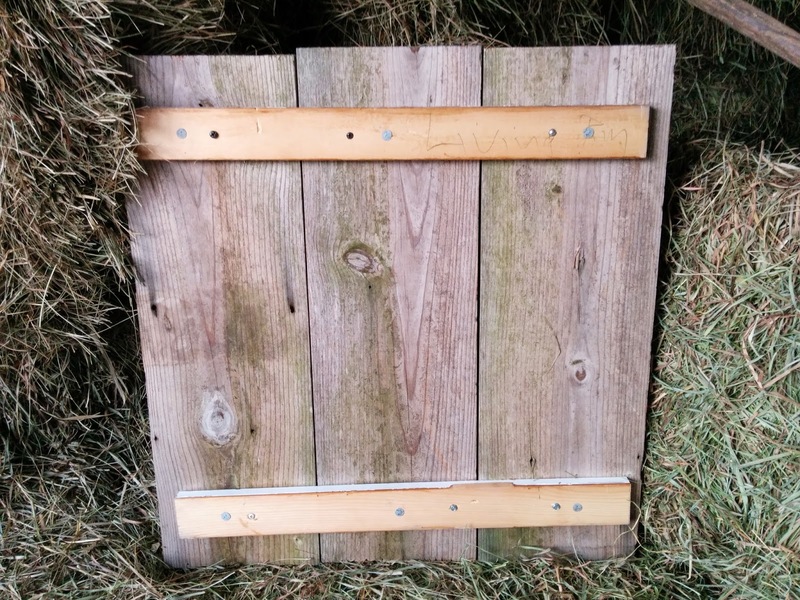 Lay your thinner bracing pieces across the back slightly in from the top and bottom edges. I like to drill pilot holes with a drill bit slightly smaller than my screws to help prevent the wood from cracking. Start with the middle plank. Drill your pilot hole, then screw the bracing piece into the plank. Move to a side plank, drill your pilot hole, then add a screw. Move to the other side plank, repeat. Repeat for the second bracing piece. You can add nails as I did for extra reinforcement from the front or back of the piece. I used three colors of spray paint for the background to give it more depth and an aged look. I started with a light mist of charcoal gray, then dusty teal, white, and finally dark gray again. Don't forget the edges! You can also paint the back if you wish. Wait an hour or two for it to dry before starting your state outline. My mom had a sample of Valspar paint in a gorgeous shade of turquoise called Rushing Stream that was just perfect. She watches for coupons and gets one or two free each year. I drew the state shapes freehand in chalk, but if you're not good at that you can get an enlarged copy and make a stencil to trace. I painted the center of each state silhouette with a medium painter's brush, then added the edges and details with a 1/2" wide artist's brush. After it dried I gave it a second coat. A few touch ups and my painting was done. It just needs some hanging hardware on the back to be complete. You can additionally distress your piece at any stage by sanding, hitting with a hammer, or putting chains or chicken wire on it and hammering them to dent the wood. It would be fun to use these plank "canvasses" for all kinds of artwork. I think vintage inspired signs, silhouettes of famous people's profiles, or nautical themes such as anchors or mermaids would look great.